PASIG--Fresh from a grand slam rookie season, Ian Sangalang groomed to have a solid sophomore season for the Purefoods franchise. However, an ACL and MCL injury made the six-foot-seven center-forward miss the entirety of the 2015 season that saw the Hotshots relinquish all the three titles they grabbed the previous year. But just as Sangalang made a return to PBA play the next season, his steady rise to become one of the top big guys in the league today also began. With the club currently playing under the Magnolia banner reeling from the loss of former franchise star James Yap to a trade--and partly also to Marc Pingris' own ACL injury--Sangalang has become the team's main man. Despite a minor setback in the form of a fractured right hand that sidelined him for nearly two months, Sangalang was a steady force for the Hotshots, and that earned him a Gilas Pilipinas call-up for the FIBA World Cup Qualifiers fourth window later this month. 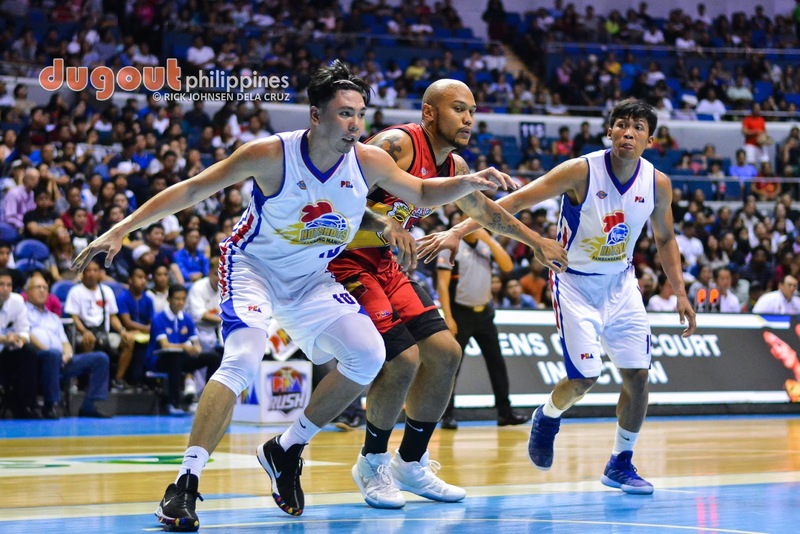 In an interview with Dugout Philippines on Tuesday night at the Meralco Gym after the national pool's practice, Sangalang said that it would not be possible if not due to his perseverance, him embracing his role, and even his teammates. "Siguro dahil sa hard work namin sa team at yung mga kailangan ko ring gawin para makarating dito," Sangalang bared what he thought are the reasons behind the call-up that in a way cemented his successful comeback from the dreaded knee injury which has already altered a lot of careers. Sangalang is a part of a solid big man rotation in the Gilas pool that also includes Greg Slaughter, Poy Erram, Raymond Almazan, Chris Standhardinger, Asi Taulava, and Japeth Aguilar, who will become eligible for a Gilas comeback in the Nationals' Sept. 17 home game against Qatar. "Sobrang gandang lineup ito. Kailangan lang talaga naming magawa yung pinapagawa sa amin para mag-click yung system," Sangalang continued. "Sana maka-adjust kami agad sa system ni Coach Yeng (Guiao)." Guiao previously said that he is putting a premium on height as Gilas travels to Tehran to face Iran on Sept. 13, meaning Sangalang has a good chance of making the "Final 12". But while the national team coach has yet to reveal his "chosen dozen", Sangalang is already thankful for being part of the pool. "Sobrang happy na naging part ako ng team," he further said. Sangalang then shared his secret to achieve his triumphant return: "Best effort lang lagi para ma-achieve mo yung goals mo."